Hong Kong's men and Japan's women created history by winning their first-ever rugby sevens gold medals at the Asian Games in Jakarta, Indonesia this Saturday. Having finished as runners-up to Japan in the last two Games, Hong Kong finally turned the tables on their rivals with a 14-0 win in the final of the men's competition. There was joy for Japan though in the women's event as the Sakura Sevens topped the podium after a tense 7-5 win over reigning champions China. Yiu Salom got Hong Kong off to a flying start in the men's final and they never looked back with Alessandro Nardoni doubling their lead on the stroke of half-time, shortly after Katsuyuki Sakai had been sent to the sin-bin. A scoreless second half resulted in Japan relinquishing their grip on the title. Until Saturday, they had won the last three gold medals on offer, establishing a 21-match winning run dating back to 2002 going into the final. “Our defence in the final was excellent and I can’t fault the guys at all. They have just been outstanding all week,” said delighted Hong Kong head coach Paul John. 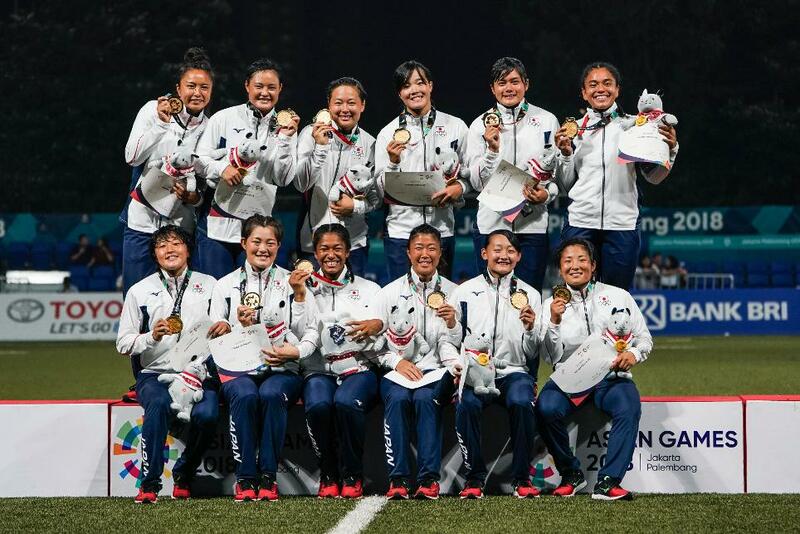 Elsewhere Korea claimed a third successive bronze, meaning the three medallists were the same as at the last Asian Games in 2014, beating Sri Lanka 36-14 in the bronze medal match. Earlier Sri Lanka nearly made it into their first-ever Asian Games gold medal match, leading Japan 5-0 and 10-5 in their semi-final before Katsayuki Sakai scored on the stroke of the half-time to make it 12-10 to the defending champions, and with no points scored in the second half, Japan went through. In the second semi-final, Cado Lee scored twice and Ben Rimene once as Hong Kong beat Korea, despite Jeongmin Jang showing his pace once more at the Games with a sensational try, to set up a repeat of the 2014 final. Malaysia bounced back from their quarter-final defeat to Japan to finish fifth, beating Thailand 33-12 and China 12-7 with tries from Amalul Nasarrudin and Mohamad Ismail. Asia Rugby President Aga Hussain was impressed with what he saw at the 18th Asian Games and is aware of the impact it will have on rugby in the region. “The Asian Games in Indonesia was another demonstration of the growth of rugby in our region,” said Hussain. “The skill of all the 20 participating teams was excellent and the competition provided excitement and drama. Congratulations to all of our medalists, having two first-ever gold medal winners shows the depth of competition in Asia. “Being involved in the 18th Asian Games is another step on our ladder of increasing participation of rugby in Asia with both the men's and women's competitions drawing excellent crowds. Yume Hirano's converted first-half try proved to be the matchwinner as Japan's women hung on to beat reigning champions China. Keyi Chen scored her 11th of the Games two minutes after the restart but her missed conversation proved costly. Having been relegated from the World Rugby Women’s Sevens Series, beating the team that replaced them was a statement of Japan’s intent not be away from the elite of women's sevens for long. Japan’s gold means there has now been a different winner in the three tournaments held to date. Elsewhere Kazakhstan won their second successive bronze at the Asian Games with a 17-7 win over Thailand thanks to two first-half tries from Lyudmila Korotkikh and two second-half tries from Kundyzay Baktybayeva, having won gold in the inaugural women’s event in 2010. In the semi-finals, Chen scored her ninth and 10th tries of the Games as China beat Thailand 29-5 before Hirano scored her fifth with Japan booking their place in the final with a 26-12 win over Kazakhstan. Earlier Hong Kong finished fifth beating Singapore 45-0 in the fifth-place play-off and Korea beat hosts Indonesia to seventh place with a 27-0 victory.